iPhone a Serious Camera for Artists – "I Took That!" This image was shot on an iPhone 5, using the Pro HDR app, and later enhancing and treating with the Tadaa app. It was selected as one of ten finalists in the LA Emerging Focus Summer Sessions, part of Photo L.A, put on by Open Show. Then last Friday, it received an Honorable Mention. The irony is that some of my DSLR images have taken hours to find and capture, then hours more to perfect in Photoshop. 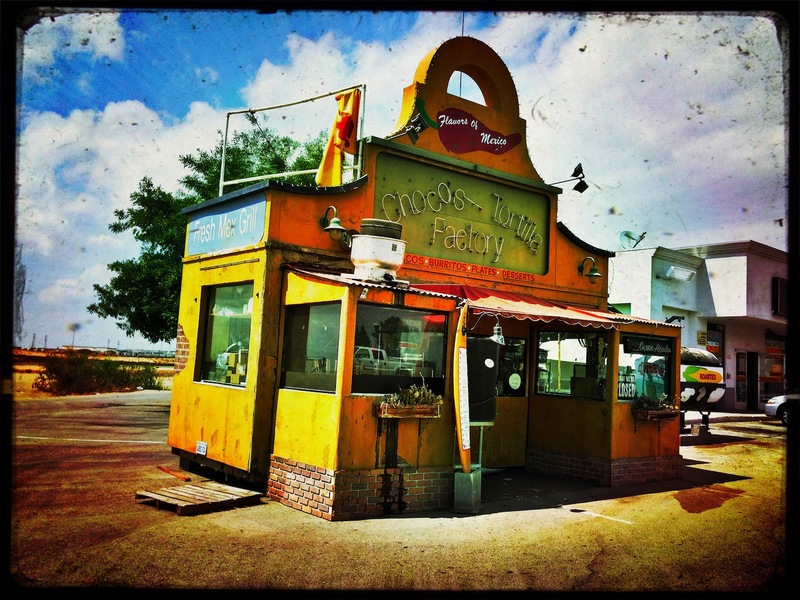 For this one, I was pulling out of a Shell gas station near Bakersfield, on our way to Yosemite, and I noticed the deserted taco stand, Chocos Tortilla Factory. The sign said it was “closed and reopening in another location*. So I jumped out of the car, grabbed a few quick shots and was back on the road again. Later that evening, I played with the image on the phone. And that was it. Later, when entering the competition, I boosted the size for printing by 10% increments in Photoshop. The result was a sharp 16×20. The iPhone (or other smartphones with a camera) is often referred to as “the camera you have with you”. And this implies the only reason for using it versus a “serious” DSLR, is that you have it with you. In my previous post, I ended on this note. But, it’s more than just having it with you. There are things about the form factor, and what’s packed into that little case. For starters, I typically use my iPhone 5 for many tasks, so I am familiar with it in my hand and most actions are second nature. It has a natural feel as the “device for everything”, so to take a picture, I don’t have to make much change. I do use a robust Otterbox case, so not worried about dropping or scratching it. It is very easy to “stay in the moment”, by having it at the ready and not having to get it out of a case, as well as not looking through a viewfinder. In this aspect, it is similar to a point and shoot camera. While you are framing the image, you are still aware of all that is going on around you. I have found that I frame differently, sometimes better, but definitely differently with the iPhone than with a viewfinder DSLR. Images have more of a sense of immediacy. The iPhone is less intrusive when shooting in a public place than is a DSLR, that can make people feel uncomfortable about being photographed. The sense of onlookers that “It is only a camera phone” can be an advantage. Yet at 8Mp, it produces a serious image (I can easily get a 16×20 print, maybe 20×30 with care in Photoshop). The “immediacy effect” is a benefit of digital in that you can preview the image you have taken while still in that place and mindset. The iPhone just feels more natural doing this and using the pinch-zoom to check details. By comparing the image with the reality, you are in a better place to later enhance and tune the image. Or you can do it on the spot except in sunlight. I prefer to fine tune it later, except with Pro HDR app, I may make a first pass at Brightness. I do wish the iPhone would capture RAW images, but the Pro HDR app reduces the downside of a single exposure jpeg, by lifting the shadows and taming the brighter areas, thus reducing the need for RAW. There is much you can do to perfect the image on the phone, with Photoshop Touch, or one of the many camera tools and adjustment apps. Too many to detail here. I have many of these – some I use for just one or two effects, like the Tadaa app. I like a few of the borders that app offers. And when you have some downtime, are bored, or feeling creative, you can easily spend a few moments browsing your images and playing with apps and effects. These can always be perfected later in Photoshop, Lightroom or Aperture. * Read the posts from Chocos on twitter and Facebook – last entry from May is they are opening inside the Shell Station Store on corner of 65 and Merle Haggard Drive. Same people, same food, now Llamas Mexican Grill. Seems they built a 5-star following on Yelp. To the folks at Llamas/Chocos – if you would like a print, just let me know and I will send one to say “Thank you”. Remember me? Valet from kc. Get a hold of me soon. So excited about getting my work in gallery. Have a show in may to prepare for. Yes, I do I remember you. You do some interesting work, with your own edgy twist. I would like hear about your gallery placement and the show in May. Sorry to not reply sooner – there was quite a few things to sort out after I returned from KC. And last week I went into the areas north of here to do some wildflower and wild landscape photography. I will be posting some in the next week or so to my Facebook photography page https://www.facebook.com/jimeverettphotography. Hope your work is going OK, and helping fund your artistry. Please keep in touch about how your photography is going. My Podcast in Apple Promo! Put Parents Back in Pictures! Photoshop – valid or cheating?